We've just come through a week of our Page of the Month classes, featuring the new Kissing Booth paper collection from Basic Grey. Unfortunately, the COLD weather (it hit -39 degrees!) a lot of people weren't able to come to class, but those that did had a good time :) As you know, we always make cards with the leftover bits and like to share them with you here on the blog. These are not those cards... heehee. I'll be back with those in a day or two. These cards also use Kissing Booth leftover bits... but these are birthday cards I made for my "Sister Dear" and a friend, whose birthdays are today and yesterday! This first card is for Marianne. 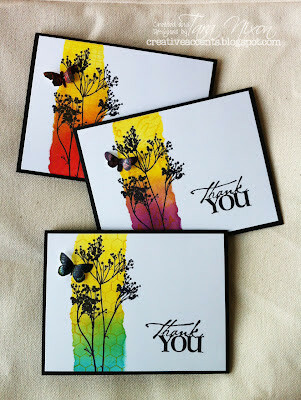 The kraft panel features a wonderful new friendship background stamp from Hero Arts. I LOVE this stamp and will be using it a lot, I'm sure! I went way out of my comfort zone on this card, adding some ruffled lace. It's very feminine, but I am pleased with the end result! Flowers, ribbon, bling... all good things :) Also on this card is a sneak peek at our February SOTM... but that's all I'm gonna say about that! My "sister dear" is celebrating her birthday today! 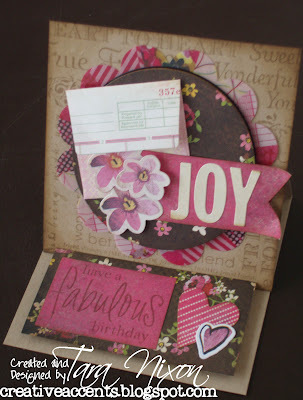 Joy loves pink so it was easy to use these papers for her card as well! I've used a die cut transparency on my card, as well as some stickers (flower & letter) and one of the envelope embellishments. It's all layered on a 4" easel card, with that fabulous friend background stamped on it. Here's what the card looks like open/standing. Major cuteness factor on a 4x4 easel card! Wow, I love these, that Hero Arts stamp is wonderful!!! OH these are both so very pretty!! i love that file envelope thingy. Very cool and I like that you made this into an easel card. Have fun with Joy!! Hugs! 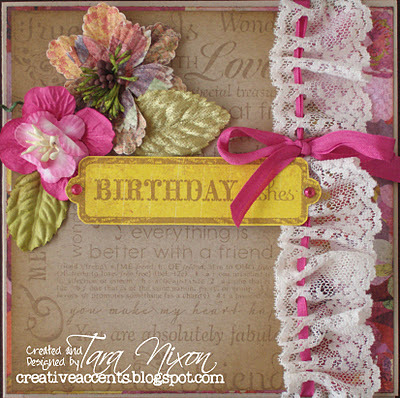 Two fabulous cards Tara, Love the lace and ribbon on Marianne's card and love the envelope on Joy's. You are one creative lady. Wish Joy a Happy Birthday for me and I am sure you two will have lots of fun together! Awwe I love them both.I've been eyeing up that stamp and now I REALLY want it! !Happy Birthday Joy!! Love the cards!! Happy Birthday Joy! !